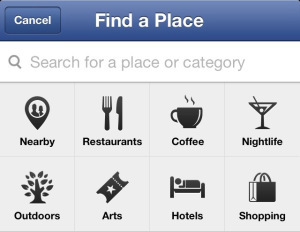 Facebook released a brand new feature yesterday called “Facebook Nearby”. Going into direct competition with online review heavyweights Yelp and Foursquare, this feature in the app for IOS and Android calls upon all the data Facebook have received from it's users check-ins, likes and recommendations. Initially, it will be rolling out to about 1% of the users, then to most others once the bugs have been ironed out I would imagine. [custom_frame_left shadow=”on”] [/custom_frame_left]Soon, when you open your Facebook app for your iPhone or Android, there won't be a list of places to check in, instead, Facebook gives you a heap of business's and places that you think you might be interested in. Pulling on it's algorithms that determine your Facebook feed, based on the likes, check in's star ratings and interactions of those business's. You are also able to search by categories, like coffee, restaurants, shopping hotels and sub categories of the main categories as well. It is presented in the form of a split-screen giving you details of the listings on the map. You can go into each listing and see details of the business, operating hours, contact information, recommendations and reviews as well any updates of that business on their timeline. Mobile users will love this. It is designed for browsing finding information quickly. Not only that, the likes, check-ins, recommendations and reviews from your friends allow you to quickly find places and services you want to use. There are a few kinks to iron out, possibly why the roll out is to 1% of Facebook users. At present, it doesn't show where your friends are currently checked in but I imagine that will be included soon, as that give a huge signal of relevance to the user. This probably will be a great opportunity for Facebook to implement ads so business's can pay for their business to stand out when people are looking for a product or service, but at present, there are no ads displayed. Will It Compete With Other Review Sites? Yes, the ability for Facebook user's to stay within one app and search for business's and reviews is a major convenience. It may not have the data that yelp and foursquare have for reviews yet, but it's massive userbase and it's ability to access the data of where your friends are and have been is something the other sites simply do not have or can compete with. Not only that, Facebook has now delivered a jab at Google, as now you can search for business and products inside Facebook instead of doing a search on Google. Facebook have always made it know that it want's to foray into search since it's alliance with Bing. Ultimately, people want recommendations they trust and they bear much more weight coming from their friends rather than strangers. Facebook nearby allows people to decide using the most powerful form of social proof available recommendations from friends. The ability for a business to stand out with an amazing reputation has now taken another turn. Business's can either embrace this new feature and build an amazing reputation, or leave it to chance and die business death with no or poor reviews.